There is an updated version of this article, click here. I have been painting up some Foundry Old West figures for use with the Legends of the Old West Warhammer Historical rules. My original plan (and still is) was to play some games using these rules in a traditional old west style environment. The sort of place that you see in old cowboy films. I do need to get some buildings and there are quite a few suppliers out there that do these. However the trailer for the film Cowboys and Aliens got me thinking about “different” old west backgrounds. Obviously adding aliens into the mix is pretty simple, though I might wait until I have seen the film before venturing down that road (and yes I know I need to paint the figures too....). I also remembered Wild Wild West , the steampunk action comedy. Now to be honest I loved the idea behind the film, steampunk in a cowboy setting, however the film itself was a bit of a disappointment. Forgetting the film it still is a really fun background. One day I wouldn’t mind seeing the original television series, however it looks like it is only available on DVD in the USA. Whilst looking for scenery for Flames of War I did come across some really nice looking Victorian SF tanks from Ironclad Miniatures. Okay so we can’t really use the name “tank” as that was merely a cover name used by the British in World War One to describe their new armoured fighting vehicles. However we now know what a tank is, and these look like tanks, just in the old west they wouldn’t have called them tanks. I am going to call them tanks even if the inhabitants of the old west wouldn’t have! Two of the range strike me as ideal models for a Steampunk Old West setting. 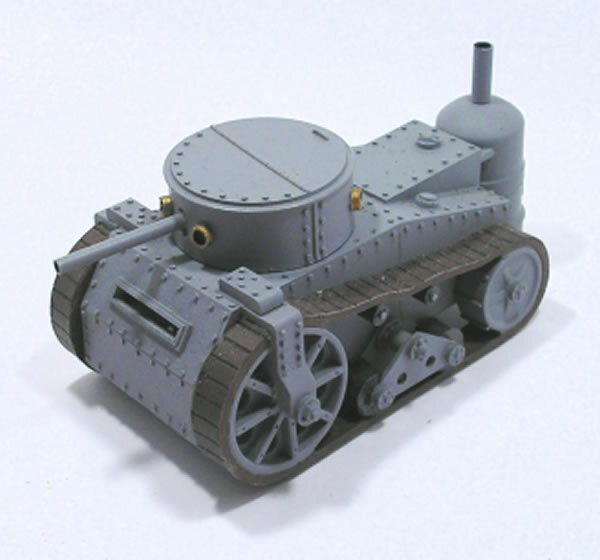 The first model is the Medium Tank is tracked steam tank with a single large turret. 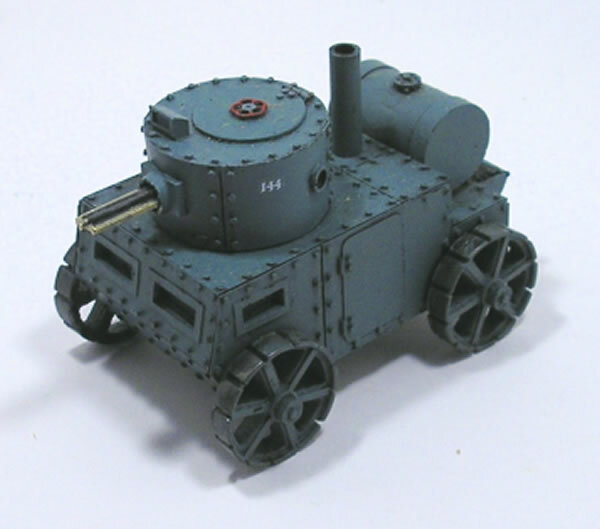 The second is the Armoured Steam Carriage, it can be built with either a Nordenfelt or Gatling machine gun. Both of these look very steampunk and painted in desert colours would fit nicely into an old west setting. There are other models in the range that would probably also work just as well, but these two are the ones I like. Well The Old West rules are from Warhammer Historical and are based around Warhammer, to me it would probably work to use the tank rules from Warhammer Historical’s World War One rules, The Great War. The weapons though in The Old West wouldn’t hurt these tanks (well except the nitro) so if these tanks were to be used then we would need some extra weapons added. Again the rules from The Great War allow for the use of artillery and gatling guns. 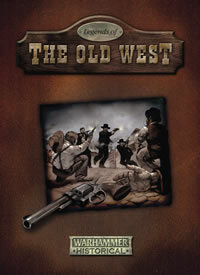 The Old West is circa 1882 and the Gatling Gun was patented in 1862. Of course in a steampunk setting you can allow for the rapid advance of weapons as well as the introduction of tanks. For example the French 75mm field gun was in our world adopted in 1898, well we could bring that forward, couldn’t we? Anyhow a variety of artillery was used in the American Civil War and that could be used for a steampunk old west game for fighting against steam tanks. 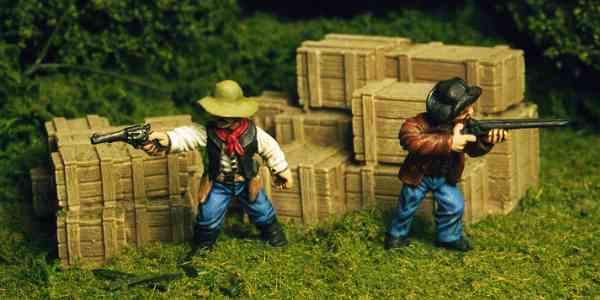 So before going down this road, I think I need to paint up some more of my Old West miniature, however I do have a couple of the Dixon's cowboys that are painted up that I could use.